The intrusion of saltwater from the sea into rivers and groundwater is a serious issue, but the threat is not from a reversal of flow, and our far inland lakes and rivers are not expected to be directly affected by the salty water of our oceans. However, the sensitive areas around the edges of our continents, where fresh water meets salt water, are at risk, and greater efforts must be taken to protect them. Some 40 percent of world population lives less than 40 miles (60 kilometers) from the shoreline. According to the Intergovernmental Panel on Climate Change (IPCC), global average sea levels should rise eight to 34 inches by the year 2100, a much faster pace than the four to 10 inch increase of the past century. Seas rise because of higher global temperatures, melting mountain glaciers and polar ice caps, and other factors. Higher temperatures also cause thermal expansion of ocean water, intensifying the problem. Rising sea levels cause major problems as they erode and flood coastlines and, yes, as they mix salt water with fresh. A November 2007 article in ScienceDaily posited that coastal communities could face significant losses in fresh water supplies as saltwater intrudes inland. And whereas it had been previously assumed that salty water could only intrude underground as far as it did above ground, new studies show that in some cases salt water can go 50 percent further inland underground than it does above ground. Estuaries at the mouths of rivers have in the past handled rising ocean levels. Sediment that accumulates along the edge of an estuary can raise the level of the land as the sea levels rise. 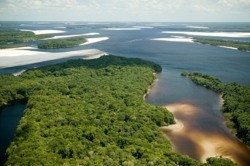 And mangrove swamps, which buffer many a coastal zone around the world, flourish in brackish conditions. But because of our preference for living in coastal areas, and our habit of re-engineering our surroundings accordingly, humans make matters worse by preventing natural processes from managing the change. On the coast, we build roads and buildings, and replace natural buffers like mangrove swamps with dikes and bulkheads to control flooding, which make the problem worse by preventing beach sediment from collecting. And as we dam rivers and create reservoirs, we trap the sediment that would naturally flow down to the sea. In some places, changes are happening. Governments are beginning to restrict or prohibit building in setback zones along the coast where risk of erosion is the greatest. A newer policy of “rolling easements” is also being tried, where developers are allowed to build in restricted zones but will be required to remove the structures if and when they become threatened by erosion. The IPCC recommends more drastic actions, such as creating more marshes and wetlands as buffers against the rising level of the sea, and migrating populations and industry away from coastlines altogether. It definitely makes more sense from a green perspective to keep your old car running and well-maintained as long as you can—especially if it’s getting such good mileage. There are significant environmental costs to both manufacturing a new automobile and adding your old car to the ever-growing collective junk heap. A 2004 analysis by Toyota found that as much as 28 percent of the carbon dioxide emissions generated during the lifecycle of a typical gasoline-powered car can occur during its manufacture and its transportation to the dealer; the remaining emissions occur during driving once its new owner takes possession. An earlier study by Seikei University in Japan put the pre-purchase number at 12 percent. Regardless of which conclusion is closer to the truth, your current car has already passed its manufacture and transport stage, so going forward the relevant comparison has only to do with its remaining footprint against that of a new car’s manufacture/transport and driver’s footprint—not to mention the environmental impact of either disposing of your old car or selling it to a new owner who will continue to drive it. 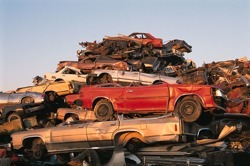 There are environmental impacts, too, even if your old car is junked, dismantled and sold for parts. And don’t forget that the new hybrids—despite lower emissions and better gas mileage—actually have a much larger environmental impact in their manufacture, compared to non-hybrids. The batteries that store energy for the drive train are no friend to the environment—and having two engines under one hood increases manufacturing emissions. And all-electric vehicles are only emission-free if the outlet providing the juice is connected to a renewable energy source, not a coal-burning power plant, as is more likely. 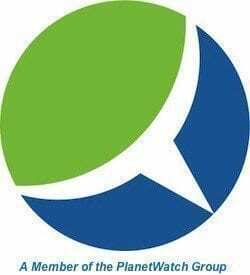 If you want to assess your current car’s fuel efficiency or emissions, there are many services available online. The government website FuelEconomy.gov provides fuel efficiency stats for hundreds of different vehicles dating back to 1985. Websites TrackYourGasMileage.com and MPGTune.com can help you track your mileage and provide ongoing tips to improve fuel efficiency for your specific make and model vehicle. MyMileMarker.com takes it a step further, making projections about annual mileage, fuel costs and fuel efficiency based on your driving habits. If you have an iPhone, you can keep track of your car’s carbon footprint with the new “Greenmeter App” from Hunter Research and Technologies. The program uses numerous variables to make its calculations on-the-go as you drive, including weather conditions, cost of fuel, vehicle weight, and more. If you simply must change your vehicle, be it for fuel efficiency or any other reason, one option is to simply buy a used car that gets better gas mileage than your existing one. There’s much to be said, from many environmental vantage points, about postponing replacement purchases—of anything, not just cars—to keep what’s already made out of the waste stream and to delay the additional environmental costs of making something new.